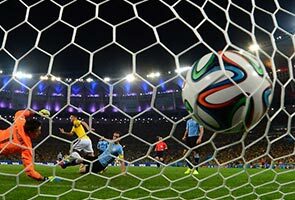 RIO DE JANEIRO: Uruguay coach Oscar Tabarez likened James Rodriguez to Diego Maradona after his sublime volley inspired Colombia to a 2-0 victory in the World Cup last 16 on Saturday. "For me, special talents are those who do things that are completely out of the ordinary," said Tabarez, whose side were beaten by two Rodriguez goals at the Maracana stadium. "Diego Maradona, Lionel Messi, Luis Suarez, James Rodriguez – they do things because they have certain gifts that make them special." Rodriguez, 22, opened the scoring in the 28th minute with a sensational goal, chesting the ball down and hammering a volley in off the crossbar from 25 yards. He doubled his tally early in the second half, sweeping home Juan Cuadrado's knock-down to move to the top of the Golden Boot standings with five goals. "I believe he's the best player at the World Cup," Tabarez added. "I don't think I'm exaggerating. He's a young player. We tried to limit his influence, but he kept going and made his presence felt. "Hopefully he'll continue to progress, because he's very young. Football needs players with these characteristics." Colombia's victory means that they will face hosts Brazil in the quarter-finals in Fortaleza on July 4. Colombia coach Jose Pekerman, who led an Argentina side containing Messi to the quarter-finals in 2006, said that Rodriguez was a player with rare and unusual gifts. "In my long experience in football, I've had extraordinary footballer players in my teams, elite players of a very high technical level," said the Argentine. "I placed James in the centre of everything, because I saw the extraordinary ability that he had. "What's most surprising is that at his young age, he doesn't have any problem taking responsibility for doing things that some footballers take many years to understand. "He's a technical player who has everything to be a top player at a world level, both in terms of helping his team-mates to play and in taking the time to evaluate situations to see what needs to be done as a team. "I have great praise for what he's doing. I never had any doubts that this would be his World Cup." Rodriguez, who joined Monaco from Porto last year in a 45-million-euro ($61 million) deal, said that he was delighted to have helped guide Colombia to the World Cup quarter-finals for the first time. "We're very happy, because we're making history," he said. "When I was younger, I always wanted to be here. It was a big dream of mine, and we hope we can make it bigger. This is a team that really wants to win." V!VA: Bombing in New York!